All my life I have been pro-oxygen. Definitely coming down on the side of more oxygen not less. 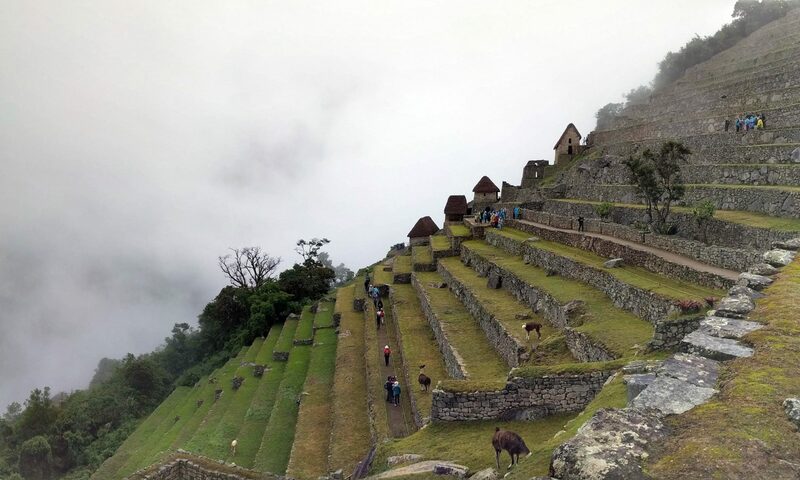 The first day of our 4-day Inca Trail cemented this position into a fervour. They say absence makes the heart grow fonder, and the rapid pumping of my heart could perhaps be mistaken for fondness. It started out simply enough. Rising gradually, we walked the undulating, sometimes bumpy path of ‘Peruvian flat’ (as our guide Sandro calls it). Stunning views immediately. Even if the path and landscape around us had been dull, the distant glacier-capped mountains in the distance were distraction enough. The landscape below us was mainly farmland, but around us was dry ground, with foliage and cactuses at the side of the path. We tasted the fruits of the cactus plants which were being sold by holidaying school children. It was juicy and refreshing. An ideal mini-break in the hot sun. Interestingly th e fruits of the cactus aren’t the most useful part. The fungus that grows on the cactus is a source of a strong purple dye – it explains some of the colourful natural dyes used in this region of Peru, many of which are derived from this fungus in the area. The dye is now less important with synthetic dyes being so common, but it was once a very valuable commodity for the area. As the day wore on, with the refreshing fruits long past, the sun continued to blaze, and we went higher and higher. As we rose I was hit by the altitude much worse than the others, who had been in Peru for a week longer. Worryingly at about 3,500m above sea level (and not far from the end of the day) I got a nose bleed. Nosebleeds are associated with the worst kind of altitude sickness, and I was understandably kinda freaked out. 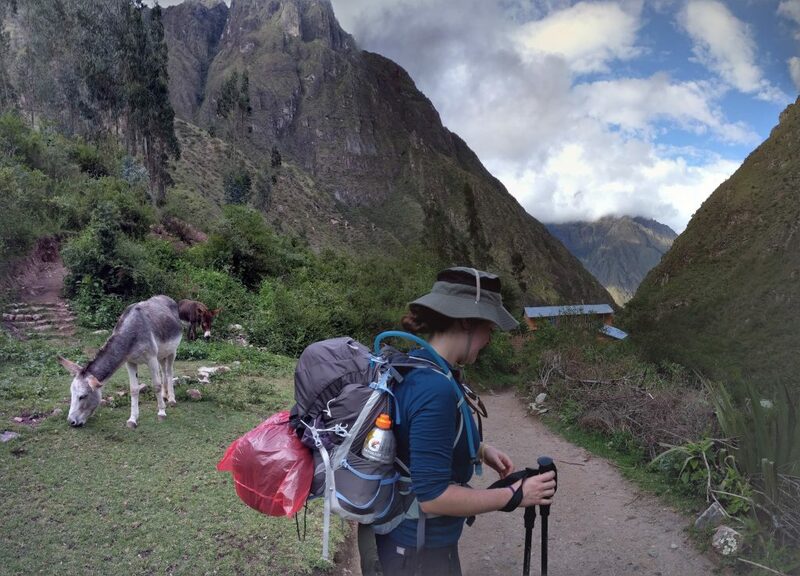 I was also feeling light headed from the effects of altitude, and was dog-tired. I bled on the ground, I bled on leaves, I bled on tissues, I bled on my bag (as I discovered 3 days later). 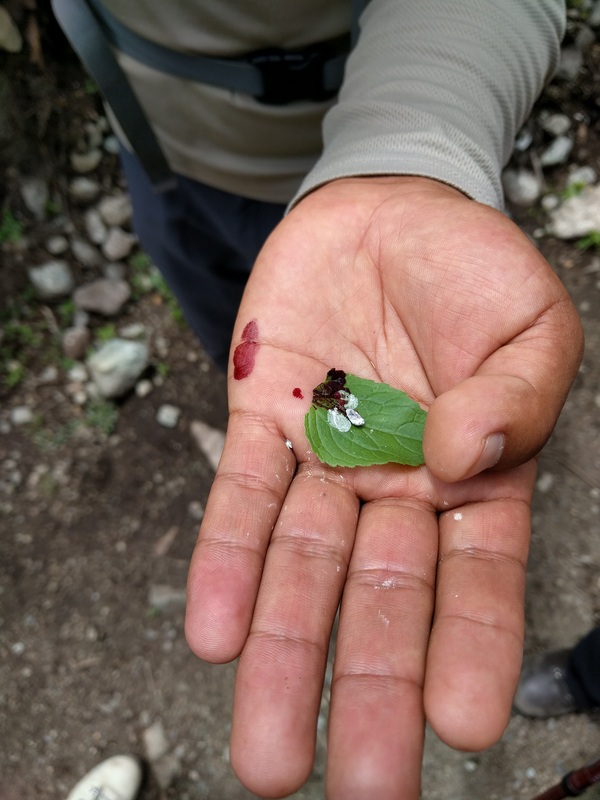 Fortuitously it seems to have been just a normal nosebleed, and did stop eventually, but we certainly proved that high altitude = bleeding copiously. I’m glad I didn’t graze my knee or get a nasty papercut. I would have flooded a valley. That final 15 minutes to the campsite was pretty difficult with a light head, and a now complaining stomach, but at least we were able to take it slow. Our mantra throughout was ‘move like a sloth’. When your muscles don’t respond properly, and you can’t properly catch your breath, taking every step carefully is the best approach. We were lucky to not feel pressure to go faster, since it was just me, Kristin, and a friend of ours Clare in our own group. Just a group of 3, with a single tour guide (and 7 porters hurrying ahead of us). It meant we set our own pace, and don’t have to awkwardly get to know people when we’re tired. Our sloth-like approach meant we were passed all day by what I’ve been calling (in my catchy way) ‘fast silly people’. People practically running up the mountain. Like the tortoise and the hare, we keep catching them up at every rest stop. They lie on the ground clearly suffering, and still exhausted having been at the rest stop for 20 minutes already. Groups of 10-15 chugging water and snacks. 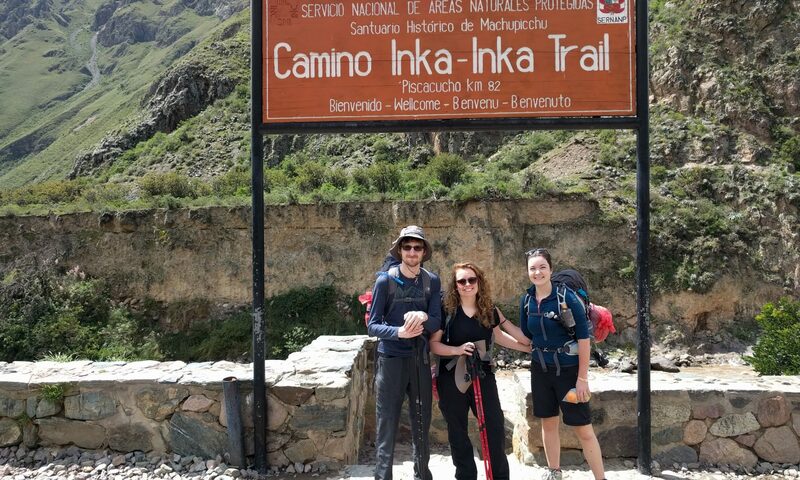 It isn’t the fast approach to mountain climbing at altitude that baffles me though – they are clearly fitter than me, so more power to them if they want to run the Inca Trail (They won’t be beating the record time, which is apparently 3 hours and 45 minutes. Our 4 day hike seems less impressive in the light of this.). What really baffles me is why they all seem to have earphones in while they climb. Maybe the sounds of nature are too boring? Are they all getting pumped listening to DMX? Is there an accompanying audio guide I missed out on? Do they feel uncomfortable without the sounds of traffic in their ears? ‘To be honest with you guys’ (a phrase used at least once in every conversation by our guide) I enjoyed the sounds of the walk, though I’ve been surprised by how loud the river at the bottom of the valley is. It keeps winding its way around the mountains, 100s of metres below, and often heard even when out of sight. I’ve been surprised too that this part of the Inca Trail is inhabited. Since the only access is by the trail, motorbikes rushed passed us early in the day. Later in the day it seems only horses and llamas are able to traverse the tracks. It’s useful for us, since it means we can buy cold water and soft drinks! Much needed during a tough introduction to walking at altitude. We were repeatedly told by our guide that Day 1 is a training day. A simple introduction to walking at altitude. Apart from the last 30 minutes it was good training. Day 2 is supposed to be the real test. Day 2 we’ll get up early to walk up to 4,215m. I will never have been so high in my life.